The Revivo Project is one of the most successful bands in Israel. The three singers in the band are Israeli musical producer and composer Raviv Ben Menachem, Raviv’s brother – Nir Ben Menachem, and their close friend Eliran Tsur. The project wasn’t founded for commercial use -- the band members’ goal was to record and reproduce their favorite’s nostalgic songs into medleys, and to respect the Israeli singers and creators of the 70’s and 80’s. The band created for their music colorful video clips in the style of “Takzina” – a form of gathering with music and liquor that was very common in those years. The success was immediate and surprised the whole Israeli music industry. The band released seven albums, including a live album from their huge 10,000 people concert in front of the walls of the old city of Jerusalem. All of them were a huge success in Israel and around the world with tens of millions of views on YouTube and millions of uses on digital music stores. The band also won many awards such as “band of the year” award, gold albums and the YouTube silver button award for having more than 100,000 subscribers on their channel. Today the Revivo Project joins us in welcoming Shabbat wherever we are. 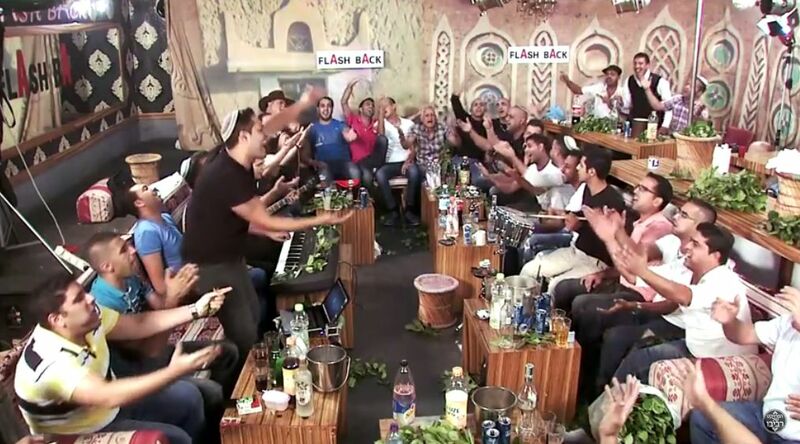 We're not exactly sure what they're drinking, smoking, and chewing, but judging from the fun they're having with Lecha Dodi and the other Shabbat songs in the medley, we'll have what they're having.